This article on the future of the European Energy Market is written by Carola Dieudonné, reporter on Euro-Russian affairs. This article originally appeared on 21 november 2016 on Climategate.nl, and is republished because the topic is still relevant today. A brief take on the European Autumn Gas Conference (EAGC). At the annual EAGC event, which took place at the World Forum in The Hague between the 14 and 16 of November 2016, high level energy professionals of major gas and energy companies and experts from academia discussed the new realities for the gas industry. Topics included the new sources of gas supply, energy security, infrastructure projects and geopolitical relationships. To better understand the European gas market, it might be useful to first look at EU’s gas supply portfolio, as presented by ACER & CEER’s Annual Report on the Results of Monitoring the Internal Natural Gas Markets in 2015. As shown in the graph, the EU relies on imports of piped gas or Liquefied Natural Gas (LNG). Russia is the main EU supplier with a share of around 30% of supplies (42% share of imports from third countries), followed by Norway and Algeria. LNG imports totalled more than 12% of EU supplies in 2015, a 18% increase compared to 2014. Qatar is the key LNG supplier, followed by Algeria. Domestic conventional EU production accounts for less than 30% of overall gas supplies and its share continues to decrease (-8% in 2015 vs 2014 and -10% in 2014 vs 2013, approximately 15bcm less in two years). It is expected that by 2030 the share of domestic production could drop to below 20%. An important factor for this is Groningen field’s decreased production (-24% in 2015). Paul Corcoran, Finance Director of the Nord Stream 2 AG, pointed out that EU gas demand will remain steady. The EU domestic gas production has fallen and is expected to continue to fall further within the next 20 years. According to him, traditional suppliers from Norway and Northern Africa will not be able to supply Europe at today’s level anymore and there is not much gas supply to be expected from the Caspian region. Renewables are unable to fill the supply gap and coal is not an environmentally-friendly alternative. This means that additional infrastructure is necessary to fill a substantial import gap of about 120 bcm. Corcoran stated that, Liquefied Natural gas (LNG) and Russian gas are the only two true solutions. According to Corcoran, Nord Stream 2 is able to deliver up to 55bcm per year, “which can supplement, not replace other supply options”. Corcoran mentioned that the Nord Stream 2 project is on track and the pipeline will be ready to deliver gas from the end of 2019 onwards: the pipe-lay contract award will be done before end of 2016 and the construction will start in 2018. Technically, since Nord Stream 2 broadly follows the Nord Stream 1 routes across the Baltic Sea, it can be launched straight into the Nord Stream 1 project. As a European project, it includes many. Ludger Hümbs from GASCADE Gastransport discussed the European Gas Connecting People (), a pipeline that is to be constructed to distribute the natural gas arriving in Germany via Nord Stream 2 to the heart of Europe through a secure transport network. According to Hümbs, via this pipeline, flexibility and supply security in the market will be increased, especially in South-Eastern European market. EUGAL, a subsidiary of Gazprom, is able to interlink various infrastructures in Germany and neighbouring countries and is fully EU-regulated. The building of the pipeline is supposed to start from the beginning of 2018, so that gas can start flowing at the end of 2019. Tapping into concerns over energy security, Philip Lambert, Chief Executive Officer of Lambert Energy Advisory, pointed out that Russia had been a reliable deliverer of gas to Europe for almost 50 years with the exceptions of two weeks in 2008/2009. For some context, this is a reference to Russia’s gas supply cut-off to Ukraine in January 2009. The cut-off happened as a result of various transit and price discordances, and failed negotiations when Russian Gazprom refused to conclude a supply contract for 2009, unless the Ukrainian gas company Naftogaz paid its accumulating debts for previous gas supplies. In the end, the issue was settled between Putin and Tymoshenko via a new contract deal. However, for some countries, such as the Baltics and South-eastern European countries, it signalled the importance of gas supply diversity and transit security to avoid the risk of sudden gas flow interruptions. Much attention was given to LNG as an alternative energy source for Europe. Jason Bardoff US, professor of professional practice in International and Public Affairs and founding director of Center on Global Energy policy of Columbia University, pointed to the great potential of U.S. LNG supply, made possible by the Shale Revolution. According to Bardoff, cheap LNG has great potential for the European market; until now most U.S. LNG cargoes have gone to South-America. He also referred to the geopolitical, foreign policy and energy security concerns of Europe, because of the perceived insecurity of Russian gas dependence. Yet, according to Bardoff, “security comes not from getting off of Russian gas, because it is by far the cheapest source of gas and had been a reliable supplier of gas to the vast majority in Europe. The security comes from increasing integration and interconnectivity in the pipeline network to allow more optionality in the event of disruptions in certain places”. Andrew Walker, Cheniere Marketing’s vice president for strategy, emphasized LNG is important for the European supply diversity and is perceived as such among policymakers. Although not much LNG has been exported to Europe yet, supply to Europe is likely to increase with new LNG projects from Australia. During a discussion session John Roberts, Senior Partner of Methinks and former Managing Editor of Platts and Financial Times Energy, stressed the importance of energy security. For interconnectedness among European member states, upgraded infrastructure was needed. In this way, all countries of the European continent have access to gas market competition and, are able to deal with potential crises in case of major pipeline cut-offs from Russia or Norway. An effective distribution system, therefore, between European member states facilitates free gas flow between LNG terminals on the Baltic, Adriatic, and Aegean Seas. Some steps have already been taken; as such, it should be noted that Lithuania and Poland already invested in off-shore LNG terminals (Klaipeda and Świnoujście respectively) for increased supply diversity, and energy independence from its main Russian gas supplier. The lower reliance on its main supply source enables gas price negotiations and energy-security guarantees for neighbouring countries. 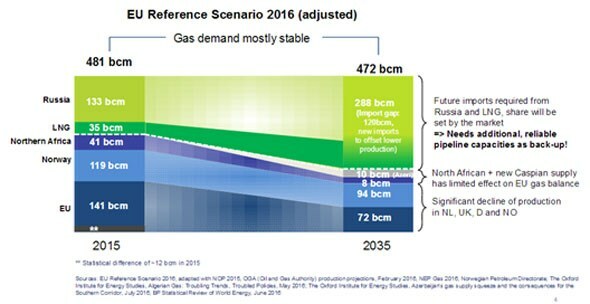 A predominant theme throughout the event was how to improve the general image of natural gas in a post- COP21 reality. Generally speaking, most experts agreed that the gas industry had to better convey the benefits of natural gas, and emphasize its role as a green solution committed to the energy transition. According to Philip Lambert, the gas industry is facing an “existential crisis”. He reasoned how this was completely unreasonable, since gas does not emit sulphur or particles, in contrast to the coal industry which creates urban smog around the world. Gas companies are “pathetic at defending [their] fuel” and should, therefore, not let themselves be “hijacked by carbon”. Instead, they have to promote natural gas as a green fuel able to sort out the world’s atmosphere in a responsible and affordable way, instead of promoting costly renewables. In a similar line, Dr. Ludwig Möhring, Managing Director Sales of WINGAS (Gazprom subsidiary), put emphasis on the need for the gas sector to engage in the energy transition discourse. He argued that, despite the costs, German policymakers want to move away from fossil fuels and go all-electric in order to combat climate change. At the same time, Möhring presented a graph showing that “after five years of spending billions of euros on renewable energy in Germany, climate targets have failed and the effect was practically zero”. Yet, according to Möhring, the political discourse will remain anti-fossil fuels and pro-renewables. Therefore, the gas industry has to make a good case for gas as a green solution able to combat climate change, and build coalitions of support with, for instance, NGO’s. Similarly, Marjan van Loon, president-director of Shell Netherlands, also argued that “gas advocacy will have to be replaced by energy transition advocacy”. For this, “more and better cross-sector collaboration” is necessary to bring the gas and renewables partnership to its full potential. At the same time, van Loon mentioned that “more policy changes in favour of gas are needed” and that “there is homework for Brussels to be done”. As such, “robust carbon policies are required to make the switch to a lower CO2 energy system” and encourage coal to gas switching in the power industry. ← Will China’s Silk Road pave the way for gold?